Does anyone know if the RCV SP Engines are still in production? I'm after an RCV60SP but the only UK shop that lists them is out of stock, with no forecast for resupply, and Weston UK are not responding to emails. Perhaps best to try phoning Weston. Ring Alan at weston they now manufacturer the rcv range. He's a very helpful chap. I have been told that manufacture of RCV engines is being transferred to an engineering company in India. Don't know when though. Were they not being made in China ? The initial batches were made in UK but later I heard the production was moved to China. Yes, they were made in China, apparently the Chinese manufacturer imposed a minimum order quantity of 5000 units per engine size. Hence the move to India. Old thread I know but I need some advice, I have an RCV 58cd which is one of the quietest and most reliable little glow motors I have, turning a 12x6 2 blade prop it pulls my Sig Rascal around the sky superbly. Now here is my dilemma, I had the opportunity to purchase an RCV 60sp brand new in the box for next to nothing, now this engine has never been run so needs breaking in, I am unsure as to the cooling needs of these engines and have heard they can be picky and overheat quickly now if this engine was mounted out in the open - like most trainers - with just cowl cheeks would the cooling be sufficient or is special cowling and ducting required if so I will save it and put it in a scale model where this would be a necessity for sure. I have one of these. Naked in the airstream it is fine. If cowled, it needs careful air management to prevent overheating, as it needs air moving up and down, or side to side, rather than front to back. Nice engine once run in, but they can be slow to run in. I think mine is an early one, and for at least two hours would not tickover well enough to land. I used to dead stick it, but it eventually ran itself in. I have several RCV engines of both the CD and SP type. I have used the SP engines uncowled without a cooling scoop without problems, but I think that Weston still recommend the scoop in all applications, including running in on a test stand. 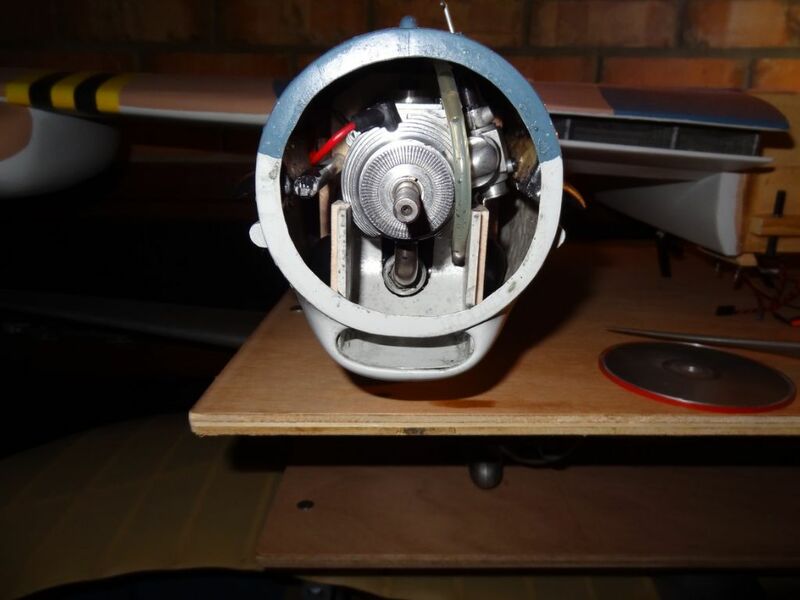 Here are a couple of photos of the installation of an RCV60SP in my mosquito, I put scoops into the cowls from the air inlet below the spinner curved through 90degree to the the air flowing vertically over the fins. All air entering the inlet flowed into the scoop and the scoop was quite tight to the fins so all air flowed through them and not around them. The air exits were furtehr back in the crankcase area. I had no issues with engine overheating with this set up. I have same comment as Don regarding lengthy running in, although in my case I kept a high tickover speed to avoid dead sticks as the Mossie landed quite fast this was not an issue. I have been running an SP60 in my Seagull SNJ for several years. As other have said follow the instructions about scoops/ baffles. Like Peters use of the Mossi intakes. 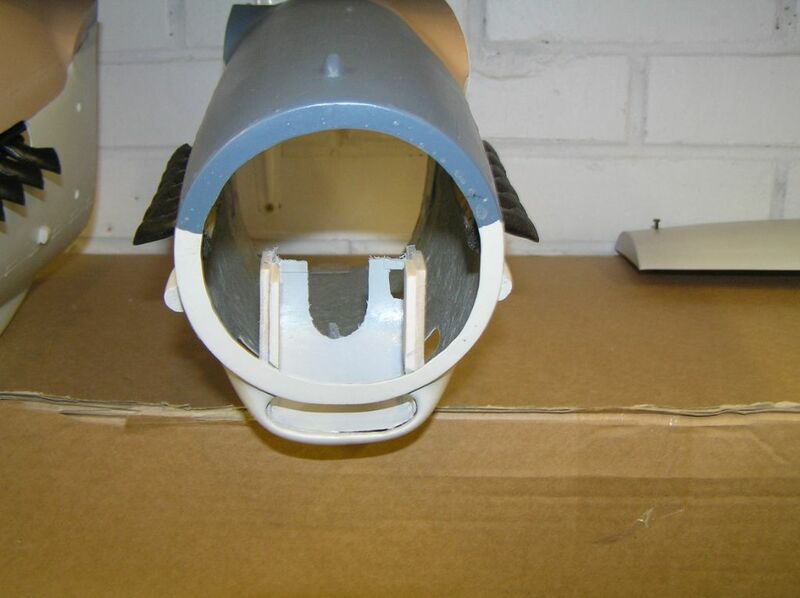 In my SNJ it is just a flat plate on one side of the radial cowl directing air across the fins. I read somewhere that RCV would have liked the fins to run along the length of the motor but the manufacture whould have been more expensive/difficult.